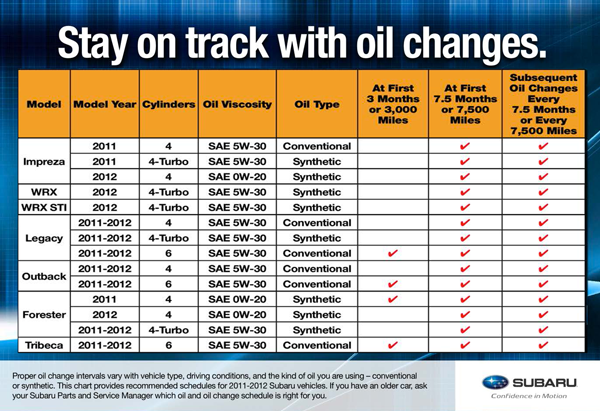 Keep up with your 2011 or 2012 Subaru's Oil Change intervals by having regular maintenance performed by Carlsen Subaru serving the San Francisco Bay area. It is beneficial to always have your Subaru Forester, Impreza, Legacy, Outback, or Tribeca serviced by Trained Subaru Service Technicians rather than an independent body shop, due to the quality service and Genuine Subaru Parts & Fluids used by Subaru Professionals. Remember to always choose Genuine Subaru Products when having service or maintenance performed on your Subaru Car or SUV. Set up an appointment with Carlsen Subaru today to keep the engine oil running in your engine as clean as possible. Having regular maintenance performed on your Subaru car or SUV is extremely important for the longevity of your vehicle. Frequent oil changes as well as other car repair & service options, provided by Carlsen Subaru in Redwood City, will keep your vehicle on the road for years to come. 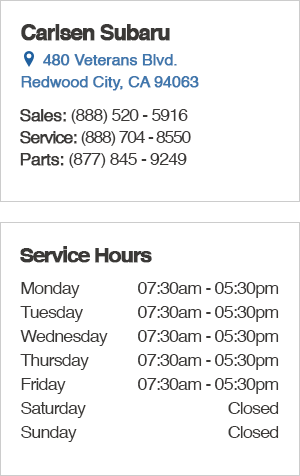 Please take a look at our Subaru Recommended Service Schedules to see if your Subaru Vehicle is ready for a tune-up! We encourage all Subaru drivers in San Mateo, San Jose, Oakland, Sunnyvale, and San Francisco to take advantage of our many Service Specials & Parts Specials available to you! We're here to help you save on your Car Repair & Maintenance without sacrificing Quality.